Clear LCD screen and Qualcomm Quick Charge 3.0. 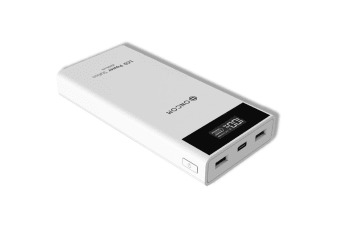 The rapid charging capabilities and practical LCD screen set this power bank apart from the rest, perfect for everyone from on-the-go professionals to all-day gamers. With the added benefit of an LCD screen, the ONCOM 20000mAh Power Bank with LCD Display lets you see exactly how much power you have remaining, so you won’t be caught unaware. Packing premium quality LG / Panasonic battery cells, this handy power bank keeps you powered safely and efficiently without being bulky – squeezing high density batteries into a slim body that can slip into your pocket. Extremely durable with a flat design and anti-winding technology, the included Diamond cable is a cut above. Get rapid charging and data transfers across all of your USB-Type C devices, and enjoy the extra-handy 300mm length. Your device must be Quick Charge enabled to enjoy this feature.